FORTUNE -- Back in 1965, The Mamas & the Papas reached the top of the charts with "California Dreamin'," a song pining for a return to the warm safety of their home state. But these days they'd be better off dreaming about Texas. The reason is that Texas powered through the global fiscal crisis, while The Golden State's economy is forecast to remain tarnished for some time. The fact that California remains locked in such a pronounced slump compared to its economically and demographically similar cousin to the southeast has been pounced upon with biblical zeal by conservative commentators who claim the state's woes are a direct result of its liberalism and sloth. But in truth, California's industrial mix and its history of voter empowerment may have done more than glad-handing liberalism to bring low the nation's largest economy -- one that, in better times, brought the world the Popsicle, the Hula Hoop, the "slimsuit" swimsuit, and the fortune cookie. 1. Diversity of jobs - accountants over homebuilders. 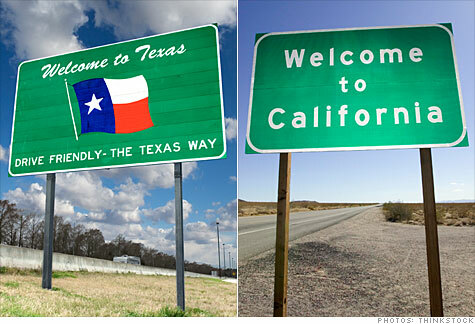 The chief reason California remains mired in a recession that Texas almost skirted is fairly obvious. Its major industries were more directly tied to the causes of the recession, resulting in steeper job loss when the recession hit. "California experienced a more acute housing bubble than most states, including Texas," says Professor Jerry Nickelsburg, who runs the UCLA Anderson Forecast, noting that California lost more jobs than many other states because it was the center of the sub-prime mortgage finance industry, and housing was a major employer. He adds that California was also hit harder than most by the slowdown in Asia, which meant that fewer manufacturing goods were being moved to and from its important ports. By comparison, housing was a relatively unimportant factor in job growth in Texas as the recession hit, with most new jobs being created in diverse professional fields such as accountancy, law, and security services. The more diverse Texas economy also benefited from its interaction with the oil and natural gas industry, which are an important part of the tax base, says Professor Steven Craig of the University of Houston Economics Department. This left the two states with starkly different unemployment pictures. While Texas recently reported that more than 8% of its citizens were unemployed, California's unemployment rate remains greater than 12%. A higher rate of unemployment is the deciding factor in determining the depth of any state's fiscal crisis. As Professor Robert Inman of the University of Pennsylvania's Wharton School found in his recent study of the issue, "the states' fiscal crises of 2009 do not appear to be linked to any obvious structural or institutional failures in state finances. It's the economy." 2. It pays to be friendly to business owners. But low-tax, small-government advocates may have a point in terms of what could prevent a more robust recovery in California. Businesses perceived California's tax and regulatory structure as so unwelcoming that the state ranked last in Chief Executive magazine's 2010 survey of the best places to conduct business, calling it "the Venezuela of North America." Texas, by contrast, ranked first. It is easy to see why. Professor Bill Watkins, who heads the Center for Economic Research and Forecasting at California Lutheran University notes that unlike California, Texas has no personal income tax, personal capital gains tax, or corporate income tax. "This is in huge contrast to California's tax structure," he says, adding that overall, Texans also just pay less in taxes of any stripe. The union situation in Texas is also far different. While only about 6% of workers in Texas are covered by unions, the Federal Bureau of Labor Statistics puts the figure at more than 18% in California. Texas also has a lower minimum wage and lower land prices. Such progressive taxes and safety nets can be good from a social perspective. "School districts are hurting" in Texas, says Professor Bernard Weinstein, an economist with the Cox School of Business at Southern Methodist University. "As a result of Texas's perennial fiscal austerity, the state has dropped from about 30th in per student spending a decade ago to 42nd today." SAT scores in the state have declined over the last few years, and the state ranked 34th among the 52 states and jurisdictions graded on the National Assessment of Educational Progress (NAEP) last year. Also, lax regulation can create other costs. The Texas Railroad Commission -- the state body that regulates the oil and gas industry -- is now reviewing its own rules regarding offshore drilling following BP's Deepwater Horizon oil spill, which occurred in federal waters. Besides the ecological damage and the impact on other gulf industries, Professor Craig says that the halt in Gulf drilling is also having a deleterious effect on the Texas economy. 3. Taxing sales instead of income distorts the economy less and allows for more flexibility. California's focus on progressively taxing income and profits instead of consumption has helped to exacerbate the pain of California's state budget shortfalls. Unlike sales taxes, which contribute mightily to Texas's annual budget, taxes on income and capital are extremely volatile, closely tracking the country's economic swings and often overshooting them. That creates two big problems: It makes it difficult to plan correctly when faced with long-term spending needs, and in boom times, it makes it hard for legislators to deny unsustainable spending increases desired by voters. It's a problem California has known about for quite awhile. Back in 2005, the California Legislative Analyst's Office (LAO) struggled with the issue, describing how a 20% upswing in annual revenues through fiscal 2000, turned into a 17% drop in 2002. "These fluctuations have been considerably more pronounced than the volatility in California's overall economy, and more substantial than the revenue fluctuations experienced in other states," the LAO authors wrote, saying this "volatility has contributed to major problems for state policymakers attempting to manage and balance California's state government budget." 4. Power of the people can backfire. But that volatility and the deficits it creates could possibly be tackled if it wasn't for the empowerment of California's voters, who gained a major taste of victory in the Proposition 13 tax revolt back in 1978 and never looked back. Since then, California voters on both ends of the political spectrum have used their clout to approve scores of initiatives. They have enacted term limits, raised the minimum wage, moved to protect wildlife and acted to foster English as the state's official language. Most importantly, from an economic point of view, voters have often chosen to impose tax and spending limits on the one hand, while enforcing minimum spending requirements on the other. As the Los Angeles Times' editorial page wrote at the end of July, "California voted itself into its current budget crisis by adopting ballot measures that demand more from government while limiting its ability to do its work." That's a big difference from the Lone Star State, where just about the only political consensus for budget cuts needs to come from three politicians sitting around a table. With the blessing of the lieutenant-governor and the speaker of the Texas House, Republican Governor Rick Perry recently pulled out the carving knife to tackle a projected two-year budget shortfall of $18 billion, demanding 10% cuts across the board. Meanwhile, back in California, a frustrated Governor Arnold Schwarzenegger has installed a budget delay counter outside his office, griping that the state's own annual $19 billion budget impasse is costing about $52 million a day, and there is no end in sight.